It’s no secret that the newspaper industry doesn’t have the brightest job outlook. 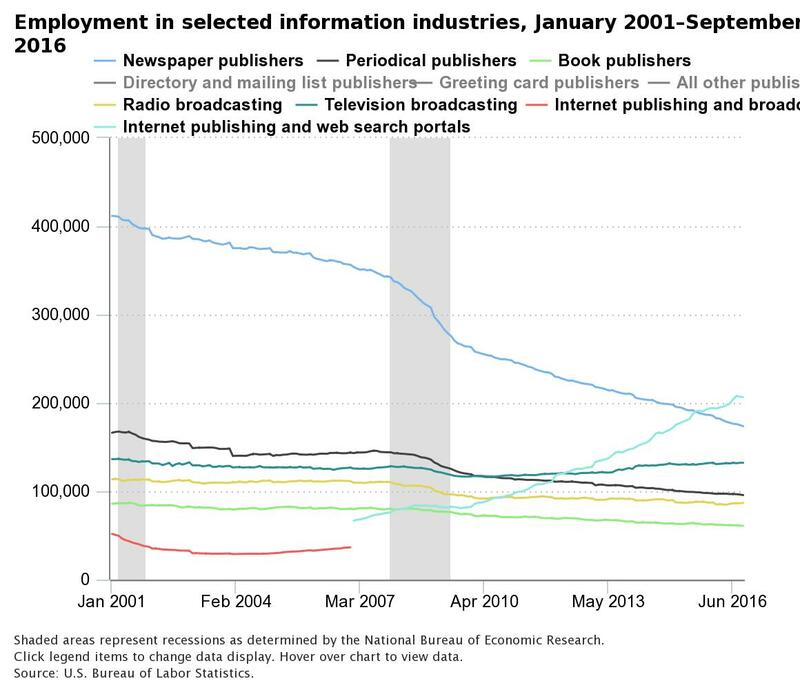 In a recent report, the Bureau of Labor and Statistics shows that fewer than half of newspaper jobs from 15 years ago still exist. For internet publishing, however, the numbers are not so grim. Jobs increased in that sector from 67,000 jobs in January 2007 to 206,000 in September 2016. Career Crossroads: Christina Joseph Robinson shares what life is like after a newspaper layoff. Mic launched nine digital brands to provide its millennial audience with more content it cares about — like equality, technology, and President Trump. Slay, a women’s issues vertical that began on Instagram, is among the brands on the list. The Wall Street Journal reports that Mic surveyed 2,500 readers and found that “what they wanted was more original reporting and in-depth takes.” The launch also includes The Movement, dedicated to social justice coverage, and The Future is Now, which covers tech. Timely: This article on Slay goes in-depth about Equal Pay Day 2017. The intersection of sports and politics isn’t new, but interest in connecting the two has intensified in the current political environment. ESPN recently reviewed and updated its guidelines for discussing political and social issues to “reflect the reality of the world today.” According to ESPN, the change is not in response to any particular incident. The new guidelines allow for increased commentary regarding politics, so long as it can be connected to sports in some way. Did you know? New poll finds that 60 percent think ESPN leans left. Facebook, Mozilla, and Craigslist founder Craig Newmark have joined 19 organizations to form the News Integrity Initiative. The coalition, administered by the CUNY Graduate School of Journalism, will spend $14 million to combat distrust in the media and advance news literacy. The project aims to focus on the ways news organziations and platforms can better inform news consumers, reports Poynter. Speaking of Facebook, see which Facebook pages get the most engagements per post. “Up First” by NPR, is the 10-minute weekday morning news podcast that aims to direct younger audiences back to public radio. The 6 a.m. podcast will feature the top news from the 5 a.m. segment of Morning Edition, but in a more podcast-friendly way. According to NiemanLab, the podcast will also tell listeners about other programming on public radio and how to donate to their local stations. You may have heard that public broadcasting media have been threatened with governmental budget cuts. Trevor Burrus from The Daily Beasts thinks NPR and PBS should stop taking government money.